With the IFA and Apple’s September 9 launch event both merely a month away, the big question on everyone’s mind is whether to upgrade their smartphones. Smartphones are all up for a major upgrade with even Sony only being a few paces away from an Xperia Z3 and Z3 compact launch. Whether you’re an Android user or an Apple fanboy-girl, next month’s events will sadly leave your device a little bit behind the specs race. Well, before you go on making the decision to upgrade, it would be pertinent to take a look at what the existing flagship devices from all the major manufacturers have to offer. So here’s our showdown on the flagship handsets of today, complete with a detailed comparison of their performance benchmarks as well. Performance, CPUs and Benchmarks Compared. Samsung’s Galaxy S5 comes in two variants based on SoC. One of these runs on the Qualcomm Snapdragon 801 with 2.5 GHz frequency while the other variant dubbed the SM-G900H comes with a much impressive octa-core Exynos 5422. The Exynos 5422 on the Galaxy S5 uses two clusters of four cores. The first pair are Cortex A7 Cores clocked at 1.3 GHz the next are Cortex A15 clocked at A15. The load and usage of these cores are alternated depending upon the performance intensity of the tasks at hand. The Exynos 5422 also has the capability to simultaneously run both the set of cores. Similar to the first variant of the Samsung Galaxy S5, LG G3 and Xiaomi Mi 4 both come with a 2.5 GHz Qualcomm Snapdragon 801. Or more precisely, the Snapdragon 801 8974-AC. This is not to be confused with the Snapdragon 801 8974-AB, which clocks at a base frequency of 2.3 GHz. While the GPU (Adreno 330) clocks at the same speed, 550 MHz, the CPU frequency differs. The Sony Xperia Z2 and HTC One (M8) come with different specifications though. While a variant of the HTC One M8 featuring a 8975AC (Snapdragon 801) with 2.5 GHz of core clock is available in Asia, the one (no pun intended) available in international markets comes with the Snapdragon 801 8974 AB. The MSM8974 AB is a slightly toned up version of the original 8974 or the Snapdragon 800. On the MSM8974AB the core clock of the Hexagon DSP increases fron 320 MHz to 465 MHz. LPDDR3 clocks go to 933 MHz from a previous frequency of 800 MHz. The Adreno 330 GPU on all the Snapdragon chips also goes up to 578 MHz from a previous frequency of 450 MHz. Coming towards the RAM available on all of these flagships, the 16 GB variant of the LG G3, both variants of the Galaxy S5 and the HTC One M8 all come with 2 GB of RAM. The Sony Xperia Z2, the Xiaomi Mi 4 and the 32 GB LG G3 receive increased memory size with the RAM on these devices beefed up to 3 GB. 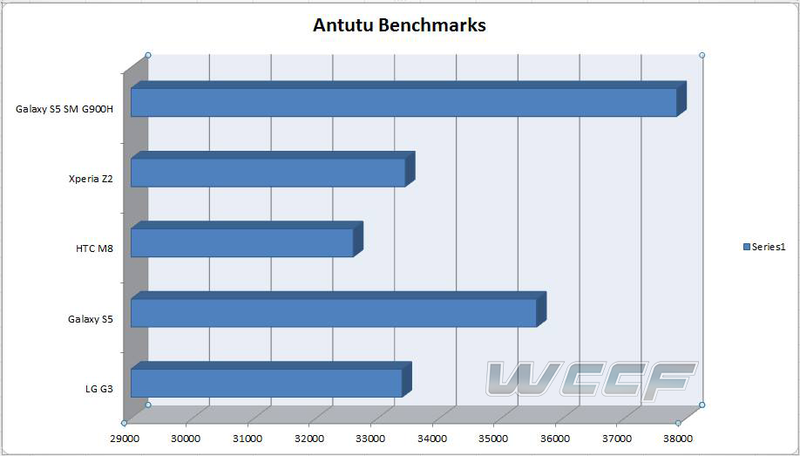 Given the performance capabilities of the Exynos 5422, it is no surprise that the Samsung Galaxy S5 SM-G900 tops the list of Antutu scores. Scores portrayed in the above chart and other subsequent charts are averages of 4 individual scores so the accuracy of any reading has not been left in any doubt. Surprising performance results from the HTC One M8, with the device being the lowest in rankings. This is despite the fact that HTC devices are particularly primed for benchmarking, and the processors themselves overclock when a benchmark app is run. LG’s G3 and Sony’s Xperia Z2 almost appear to be neck in neck for second place but the Z2 eventually takes the lead. This is primarily due to the fact that for the benchmarks presented above, the G3 European variant which has 2 GB of RAM was tested. The Xperia Z2, as I mentioned above has 3 GB of RAM. So the additional one gigabyte of RAM ends up doing the Z2 good. Absent from the list is Xiaomi’s Mi 4. Sufficient data was not available to compute definitive results for the Xiaomi flagship. However, before you end up scratching the Mi 4 off the list completely, it would be pertinent to consider the fact that Xiaomi’s flagship comes with specs similar to all of the flagship devices above. Processor for the Mi 4 is MSM8974-AC (Snapdragon 801) capable of 2.5 GHz of frequency and this is coupled with 3 GB of RAM. We all saw what a difference an additional 1 GB of RAM made above. Soon after the device’s launch, initial benchmarks gave the Xiaomi Mi 4 an impressive Antutu score of 37,156. Discounting averages, this puts it right in toe with the Galaxy S5 SM-G900. Seems suspicious but nothing’s conclusive until more data is available. We’ll keep you updated for sure. 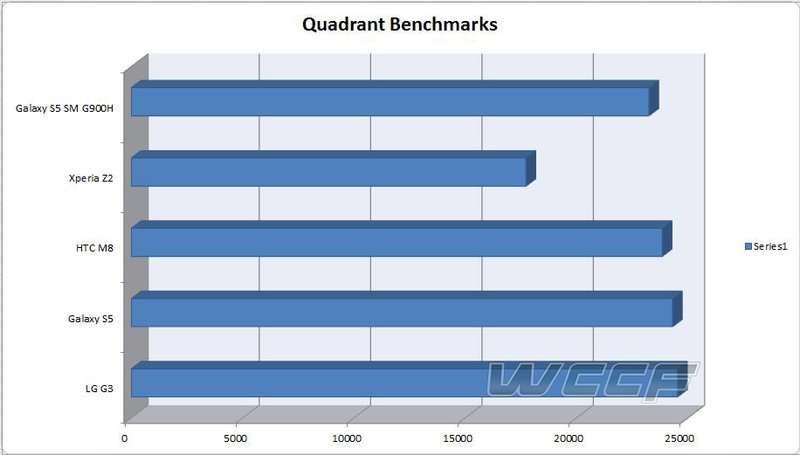 Quadrant’s scores help us get an overall better look inside the devices. The results appear to be more balanced in the app. The Exynos Galaxy S5 is no more on the top, and has its place taken away surprisingly by the LG G3. The Snapdragon Galaxy S5 isn’t too far behind with an average score of 24,320. What’s surprising here is the lead HTC’s One M8 has managed to take, and the poor results exhibited by the Sony Xperia Z2. These discrepancies represent perhaps the different ways benchmarking applications gauge a device’s performace. Or they can be used to prove the overall unreliability of these applications. 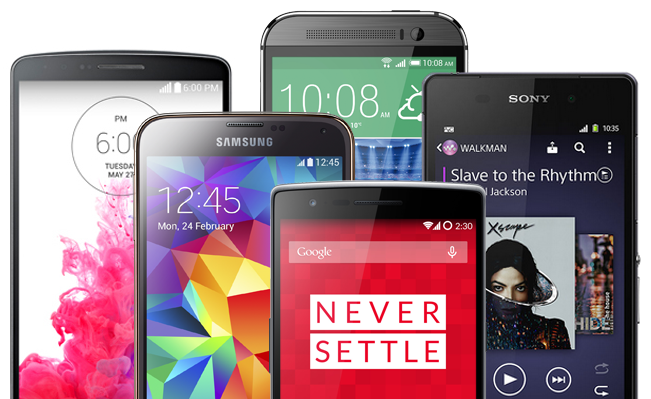 Nevertheless, according to Quadrant, all the flagships are almost on the scale with the exception of the Xperia Z2. The Xiaomi Mi 4 is once again absent, due to a complete lack of Quadrant scores available for the device.